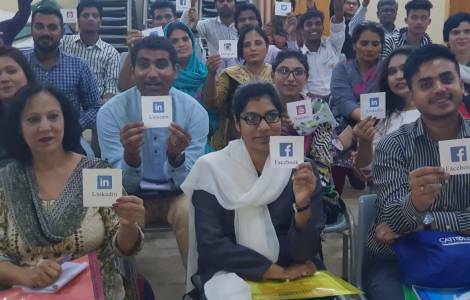 Karachi (Agenzia Fides) - "Do not use hard language on social media. We must maintain moral values in what we write: each of us is responsible for what is published ": said Friar Qaisar Feroz OFM Cap, executive Secretary of the Social Communications Commission of the Bishops of Pakistan, speaking at a workshop on Christian Media, organised recently by the Social Communications Commission of the archdiocese of Karachi, in collaboration with Caritas, Signis Pakistan and Radio Veritas Asia Urdu Service. The aim of the Seminar was to encourage media operators to work for peace. Social media Platforms are influent and have influence. It is up to us to use them to spread and promote the values of social and religious peace and harmony. The social media can serve to build good relations and create groups that help improve lives, of individuals, in cities and in society ", said Friar. Feroz. And he added: "We must promote respect for life, we must serve the truth and further solidarity among human persons instead of promoting fake news, or inappropriate images that harm community peace ". The Director also said: "I urge you to be independent of political forces, defend and promote humanity, respect ethic values and work to improve society". The workshop helped consolidate abilities, improve journalistic capacities, reflect on the positive and negative impact of social media in society. He concluded reflecting on the Pope’s Message for World Communications Day 2018, entitled "Fake News and Journalism of Peace ". Friar. Feroz urged those present to "fight fake news and combat culture of lies the power of Satan, the father of all lies that lead to the destruction of humanity”.